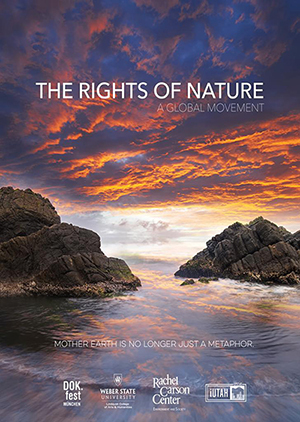 OGDEN, Utah – International environmental experts and a documentary film will introduce Weber State University audiences to a movement called “The Rights of Nature,” which advocates for granting legal status to the land, during various presentations and discussions Feb. 19-22. Weber State English professor Hal Crimmel and WSU alumnus and award-winning filmmaker Isaac Goeckeritz created the documentary “The Rights of Nature: A Global Movement.” The film, shot in Ecuador, New Zealand and Santa Monica, California, focuses on a growing environmental initiative where natural areas are given legal rights that can be enforced by people, governments and communities. Western views and legal systems tend to view nature as property and as a resource from which wealth is extracted; a commodity whose only value is to provide for human needs. For millennia, indigenous communities have viewed themselves as part of nature. This view is the basis for providing land with legal status, as discussed in the documentary. Public screenings of the documentary will be held Feb. 19 at noon in the Shepherd Union Wildcat Theater, and Feb. 20 at 7 p.m. in the Hurst Center Dumke Legacy Hall. In addition to film screenings, discussions about the Rights of Nature will take place throughout the week of Feb. 19-22. International guests include Chris Finlayson, former New Zealand attorney general and Minister for Treaty of Waitangi Negotiations, and Kirsti Luke, chief executive of Tuhoe Te Uru Taumatua, Ngai Tuhoe’s Tribal Authority, New Zealand. Noon, Shepherd Union Wildcat Theater. Film screening of “The Rights of Nature: A Global Movement.” Discussion with Chris Finlayson, Kirsti Luke and documentary producers Hal Crimmel and Isaac Goeckeritz to follow. 3 p.m., Shepherd Union Room 320. Pacific Islander Club meet and greet with Chris Finlayson and Kirsti Luke. 11:30 a.m., Elizabeth Hall Room 229. Rights of Nature Lecture. Lecture with Chris Finlayson, Former New Attorney General and Minister for Treaty of Waitangi negotiatons. 7 p.m., Hurst Center Dumke Legacy Hall. Film screening of “The Rights of Nature: A Global Movement.” Discussion with Chris Finlayson, Kirsti Luke and documentary producers Hal Crimmel and Isaac Goeckeritz to follow. Noon, Shepherd Union Wildcat Theater. Panel on Comparative Treaty Politics: How are Indigenous Rights Approached in Different Countries? Moderated by Thom Kuehls, WSU Department of Political Science chair. Panelists will include Chris Finlayson, Kirsti Luke, Michael Platero, public advocacy manager for the Bears Ears Inter-Tribal Coalition, Utah, and Rupert Steele, tribal chairman for the Confederated Tribes of the Goshute Indian Reservation, Utah. 12:30 p.m., Shepherd Union Room 404. Utah public lands and tribal rights policy solutions roundtable featuring Chris Finlayson, Kirsti Luke, Michael Platero and Rupert Steele. Visit facebook.com/therightsofnatureaglobalmovement for more information.